A few days ago a member added the Wise Guy – True Overdrive pedal from Lunastone Effects. Lunastone makes stomps out of Valby, Copenhagen. The engineer behind the effects is a guitarist named Steen Grøntved. As an interesting side note, the company that Steen runs is actually called Secret Lab. I guess the effects are just distributed under the moniker of Lunastone Effects. In digging around about where these pedals come from I found an interesting bit about the philosophy of Steen and his Secret Lab. 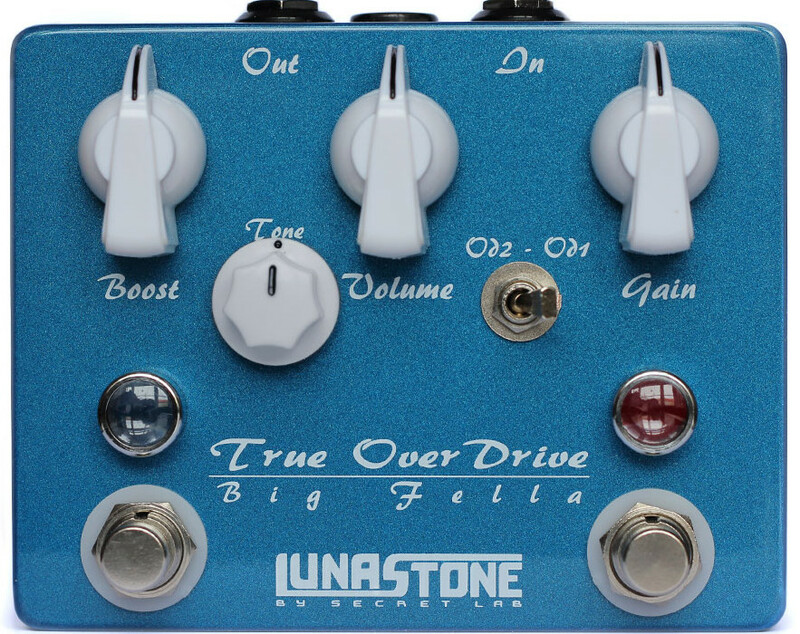 The Wise Guy (and ‘sibling’ pedal Big Fella) have the term True Overdrive attached to their name. 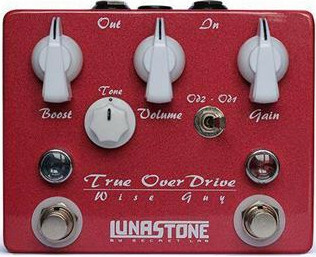 The Lunastone website gets into the electronics of the subject, explaining that an overdrive effect “originally relates to over-driving amp circuits, meaning pushing too much signal on the input, according to what the amp is designed to be able to amplify. They go on to say that, “most distortion and overdrive guitar effects on the market today uses clipping diodes to help contribute with the distorting effect of the guitar signal. ‘Wise Guy’ and ‘Big Fella‘ uses a technique that ‘overdrives’ the amp circuits with no additional help from clipping diodes.” Lunastone pedals get all the overdrive effect from cascading gain stages only, much like in a real tube amplifier. This gives very transparent and tube-like sound. If the only difference you notice is that one is red and the other is blue, you have a really good eye. So why have two pedals in your line with the only difference being their color? Well, in reality, each of these pedals have a different tone, even if the controls are the same. Lunastone explains, “The Wise Guy has a mid-tone voiced very classic overdrive sound as known from the 60-70’s but has a lot more gain to offer. The Big Fella has a huge low end and a thick body, combined with a massive smooth and transparent drive. Both pedals have plenty of gain and sustain on tap.” Sounds like something to obsess about.